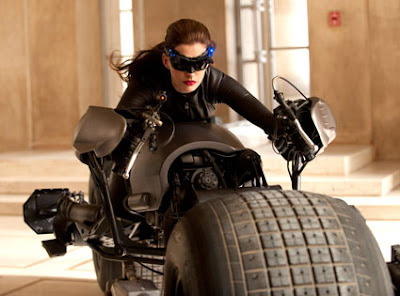 JeremyJahns.com: Dark Knight Rises Anne Hathaway as Catwoman Pic! We finally have our first look at Anne Hathaway as Catwoman......sort of......Click the Jump to check it out, and hear my thoughts. You can tell she's going to be wearing tight clothing that's a plus. I'm looking forward to seeing her with a whip! i think she will make a great catwoman. Can't wait to see this. I'm glad Catwoman is on the cast, i wouldn't think Bane would help make the movie interesting at all when i saw the teaser. The Anne catwoman pic I'm going with that she jacking the B-pod after slipping out of her mask to away from Batman." This picture is fabulous! I love that the dark knight rises jackets and your bike is just splendid!